The 3.5-metre-diameter tunnel is approximately 30 metres below the river bed, and was constructed between two 60-metre-deep vertical shafts using a Caterpillar TBM named Squirrel. The TBM was lowered in February 2014 and removed on July 17. When a key water main was damaged by river scour – or high water flow resulting from snow and ice melt – in 1997, Metro Vancouver decided a new approach was needed. The 40-year-old main, which links Coquitlam to Surrey and points beyond the Fraser River, was successfully repaired the following year, but the incident made it clear that the line would eventually have to be replaced. Enter the new $240-million Port Mann Water Supply Tunnel, which more than doubles the existing main’s capacity and runs for one kilometre below the floor of the Fraser, starting at Maquabeak Park on the river’s north side, in Coquitlam, and terminating at the CN Thornton Yard in Surrey, on the south side. The main contractor, a joint venture between Canadian contractors McNally International Inc. and Aecon Group Inc., broke ground on the project in 2011. The tunnel, which measures 3.5 metres in diameter, was completed on July 17, when the tunnel boring machine (TBM), made by Caterpillar Tunnelling Canada Corp. and nicknamed Squirrel, was removed from a shaft on the river’s north side. Workers are now installing the 2.1-metre-diameter water main within the tunnel. Completion is slated for fall 2016, at which point the main will carry roughly a billion litres of water a day from Coquitlam to Surrey. Infrastructure like this has a lifespan of up to 200 years, so engineers had to take a wide range of factors into account, such as the region’s projected long-term growth rate and above-average seismic activity, not to mention making sure the new main could withstand the Fraser’s force better than its predecessor. Part of the answer was to go deep, says Murray Gant, lead senior engineer with the Major Projects Group in Water Services at Metro Vancouver. To protect the tunnel from the weight of the earth and water above, a crew followed the TBM along inside the tunnel, assembling and installing concrete rings as they went. The end of the tunnel drive is a major milestone for the project, whose first phase was the construction of two 60-metre-deep vertical shafts on each side of the river, necessary for launching and retrieving the TBM. To dig them, workers employed a cranemounted Bauer hydromill to excavate vertical slots to the shafts’ full depth. They then backfilled those slots with concrete to create slurry walls, which provided temporary support while they excavated the shaft interiors using a Liebherr Model 855 clamshell bucket. But working below the water table added an extra challenge: to maintain stability and keep material from coming in at the bottom, each shaft had to be kept full of water. To install the necessary base slab, divers had to be lowered in cages to attach rebar reinforcements before the concrete could be poured. Once below the surface, the divers, employed by subcontractor Ballard Marine Construction of Seattle, worked in the muddy water with zero visibility for an hour at a time before being pulled back up. They then had to be moved to an on-site hyperbaric chamber within four minutes to avoid decompression sickness. The vertical shafts also posed a challenge for the mining crew: after the final concrete linings were installed, each shaft’s inside diameter was just 11 metres – much too small for the 80-metre-long TBM. The solution? Break it into pieces. “The tunnel boring machine has to basically function as if it’s fully under the river, but of course you don’t have any room in the shaft,” says Gant. “So they had all of these power cords and grout lines extending up this 60-metre-deep shaft to the surface. In all, the tunnelling took 16 months to complete, compared to a best-case estimate of three months, due to challenging ground conditions and a five-month delay when the TBM broke down with just 200 metres to go. With the tunnelling behind them, the joint venture and its subcontractors are now focused on installing the 25-millimetre- thick steel main and completing the two valve chambers that will link it to the existing water system. For its part, Metro Vancouver sees the Port Mann project as a major step in its ongoing upgrade to the area’s water system. 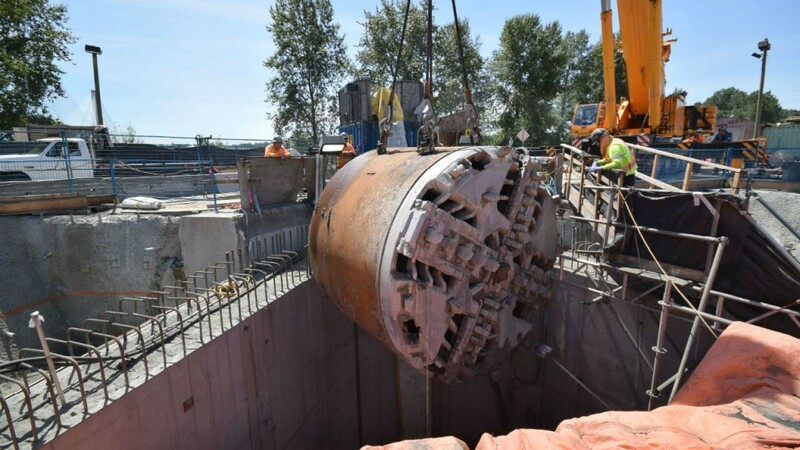 To facilitate the TBM drive and installation of a 2.1-metre-diameter welded steel water main, two shafts are being excavated on each side of the Fraser River. To dig them, workers employed a BC40/MC128 Hydromill provided by Bauer.